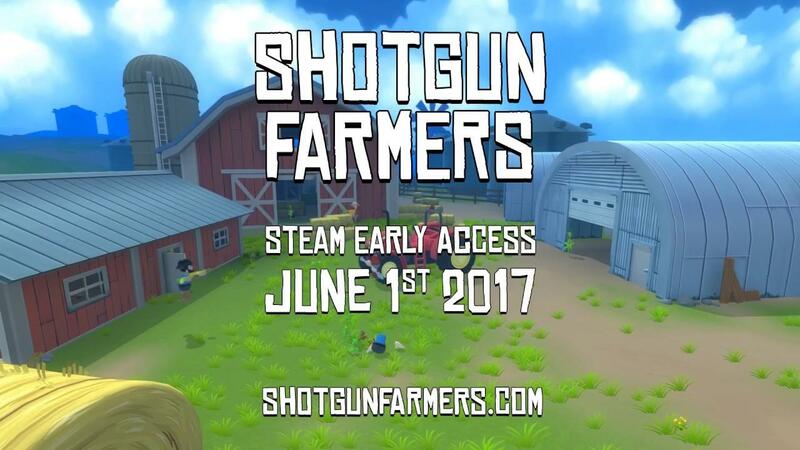 In Shotgun Farmers [Steam, Official Site], your bullets actually grow additional guns and it's so weird it works. Been having an absolute blast with it! I've tried it out for a bit and to my surprise not only does it work well, it's actually pretty good fun. It's mainly online though, with some rubbish bots in an offline practice mode so I do recommend gathering a group of people together if you plan to play it. Myself and Samsai tried it together earlier and we had an absolute blast with it. The growing mechanic is actually very clever. At one point Samsai had a sniper and he was shooting at me from on top of a roof, but he kept missing and so little sniper plants where growing near me. I decided to try and grab one, but as soon as my back was turned he jumped down and axed me in the back! It was hilarious for sure! I'm really keen to see how they expand on this during the time in Early Access. The developer actually livestreams development of the game on Twitch if you're interested in that. So they can directly talk to players and involve them in decisions. There's not a massive amount of content right now with only five main weapons, plus an axe you can find. There's also only three maps, but the developer does plan regular content updates. The main issue: Currently it seems for both myself and Samsai that the full-screen mode is broken. So you need to play it in windowed mode. There were a few other niggles, but some of which have been fixed by a day-1 patch after I had a chat with the developer before release. Absolutely love it. A wonderful idea that seriously works and I am really excited to watch it evolve with new content updates. I am happy to recommend it even now. Oh, you also get new hats when you level up, exciting right! This looks like it would be a great game that would be for kids and younger teens. I have said it before but Linux really needs games for your kids as much as big AAA games. It has cross-platform online play. That's only usually an issue with Feral & Aspyr ports. Presumably ports in general as opposed to games purpose-built for cross-platform. It's just that Feral and Aspyr dominate higher end game ports so thoroughly . . .
Bought. This looks very silly. Will give it a better playthrough on weekend. It ran ok on my laptop 540m :-) on high. Purple Library Guy Presumably ports in general as opposed to games purpose-built for cross-platform. It's just that Feral and Aspyr dominate higher end game ports so thoroughly . . . It's probably not that bad. I suspect it has more to do with the amount of data that needs to be synchronised. For an FPS that's fairly little. But for Feral's strategy games that can add up. Still, if the original developers had to deal with multiple platforms (even consoles) they would probably have made different choices. Huh! That looks like a pretty funny idea executed well. Do shotgun blasts make a whole bunch of shotgun plants grow, or just one? I wish the weapon growing mechanics were better illustrated in the trailer. They just show that it exists, not whether you can do anything interesting with it.